Activities rotate from one to the next quickly to keep players interested and for the aerobic benefit. Designed for either a 6-week time period with 3 sessions each week or a 9-week time period with 2 sessions each week. Players who play another sport in the offseason frequently find the 9-week time period works best. Ebook format. 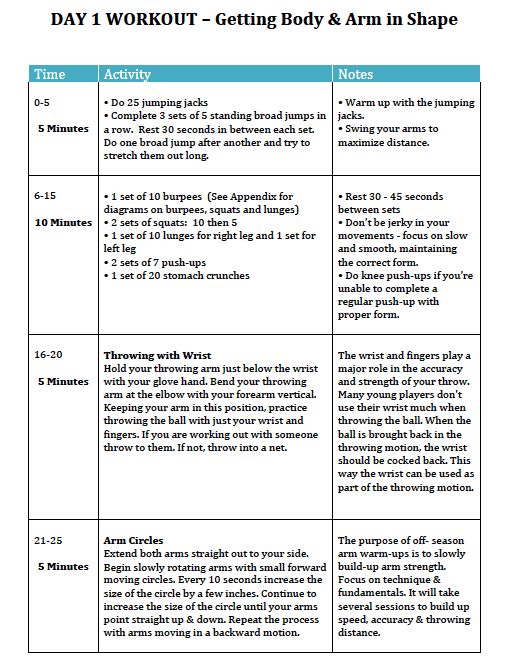 Print off the sheets you need and follow along for each workout or follow along on your smart phone. Prior to each workout we recommend players read the stories and quotes. Life lessons like overcoming obstacles, treating people with respect and the power of having a positive attitude are reinforced in this baseball training program. Ages 10 – 17 years old. It’s recommended that players have played organized baseball before. If the 66 minutes time period is too long or the activities are too challenging for younger players, we suggest shortening the sessions to 30 or 45 minutes in length. Pick and choose from the middle activities, while maintaining the warm-up and ending activities in order to reduce the time. 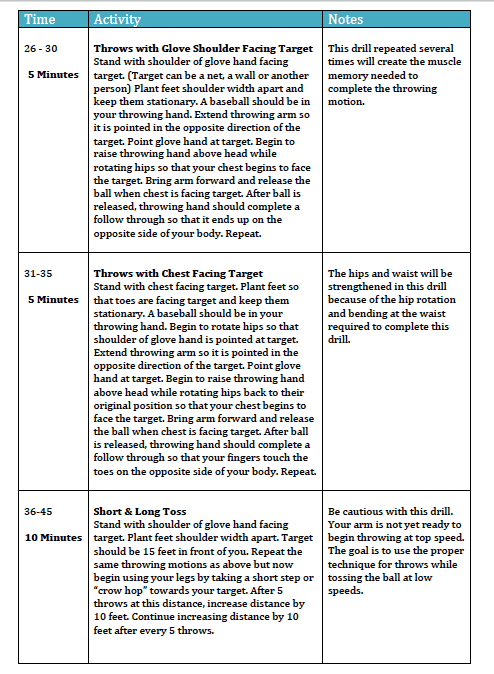 You can adapt this Baseball Training Program to your own needs. • A focus on fundamentals. We placed an emphasis on building blocks of what makes up a good baseball player because that easily transfers from one team to the next. 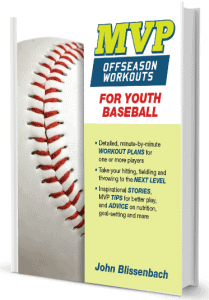 • Strong emphasis on throwing, fielding and hitting. These are 3 critical areas that can be practiced individually or with another person in an effective manner and the offseason is a great time period to work on these skills. 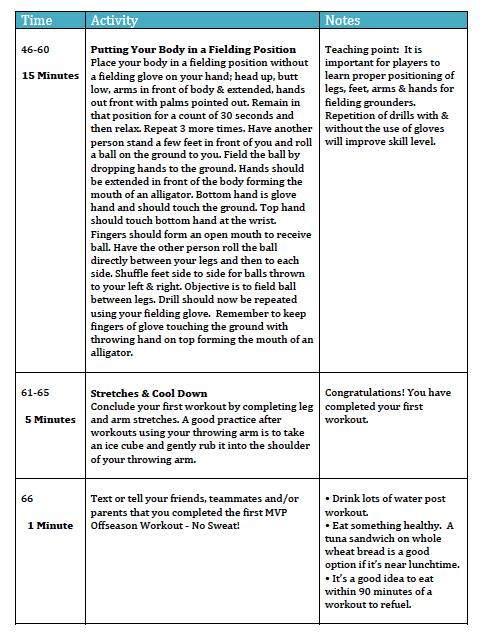 A great baseball conditioning plan for players. • Multiple position development. Youth baseball players shouldn’t just learn the skills for just one position. The best players are well rounded. They know how to play many positions. This makes them a valuable asset to any team. • Shift activities quickly. By moving from one activity to the next quickly, it keeps players interested and enables players to work on many different skill sets. • Increase the level of difficulty over time. Some of the fitness drills will get progressively more difficult. Initially, we want players to grow accustom to using different muscles and then as the plan progresses, we’ll ask for more repetitions or longer time periods. • A fitness focus. Players play their best when they’re in shape. It’s hard to execute at the highest level if you’re tired, lack strength or are just out of shape. To address these needs, a part of each workout session includes general fitness exercises. To get your body into baseball shape, there’s some strength training using your own body as weights. • Designed for individual use or with a workout partner (a friend or parent is perfect). One player on his or her own can complete most of the activities for these offseason workouts. However, workouts can be more fun with a workout partner and throwing and catching activities are better with a person than a rebound net. Players should try to find a friend to complete the workouts with or have a parent assist. • Designed for healthy kids who have played baseball before. If you have any concerns about having your child participate in this type of program from a health perspective, consult with your physician. Kids should have a water bottle and drink water as needed. Why offseason conditioning plans are important? • Repetition of an exercise builds muscle memory. By focusing in on individual skills during an offseason workout, a player gets plenty of opportunities to fine-tune those skills and really improve upon them. • Your team’s coaches don’t have enough time to devote to every individual skill. Regular season games usually present too few opportunities to hone a skill. Practices during the regular season provide more opportunities, but typically a coach has many other topics to cover. Let’s say a player wants to work on hitting pitches on the outer half of the plate to the opposite field. A player may have only see a few of these pitches during a practice or a game. However, an offseason workout might include dozens of opportunities weekly to work on hitting this type of pitch. Lots of reps lead to improvement. • Breaking down the bigger game into each of the individual components makes it easier. If a player just goes to practices and plays games; that player will likely get better at baseball. If that same player takes a different approach, putting a concentrated effort into improving some of the fundamental baseball skills, it’s likely that the player will improve at a much more rapid pace. • Provides a platform to strengthen weaknesses and build on strengths. Individual workouts can be tailored to work on the areas specific to a player’s strengths and weaknesses. • There is plenty of time until the next game. Experimenting with your batting stance, stride & swing during the season can be difficult. By working on this during the offseason, corrections can be made, and lots of repetition can take place prior to a game situation. It’s the ideal time to develop your hitting. • It’s a relaxed environment where no one is watching. Individual workouts enable players to take lots of risk with no fear of evaluation or criticism. Sometimes, it’s by taking chances and some risks, that players really improve their game. John Blissenbach has coached all levels of youth baseball from kindergarten through high school. Having coached and managed championship youth & American Legion baseball teams, John began coaching baseball in 1979 at the age of 20. He started as a high school assistant varsity/JV head coach working with varsity head coach Hank Mauer (great uncle of Minnesota Twins All-Star Catcher: Joe Mauer). In addition to coaching baseball, John has also been a coach for his 4 children’s softball, football, basketball, track and soccer teams. During the past 20 years he has had the great pleasure of coaching more than 50 youth (boys & girls) teams. He’s a big believer in baseball training programs. You’ll receive a PDF upon purchase – this product is a digital download. The PDF works on both both Macs and PCs – just make sure you have the latest version of Adobe Reader (available for free) on your computer. The PDF enables you to print out pages you want, when you need them. Plan grid that can easily be printed out or followed on smart phone. This baseball training program can be a difference maker. If you make the commitment, you’ll be ahead of the game.